I wanted to give some love to the poll winner today, but I also thought I'd change it up some and not post shoes. 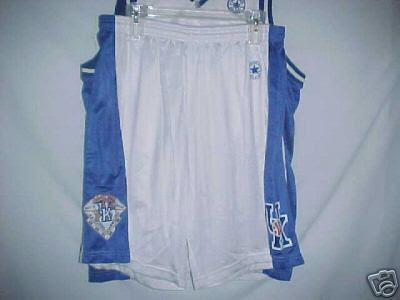 So I dug into my folders and came up with these pictures of the 1996-97 Kentucky Wildcats Home Jersey and Shorts. This was the last year Kentucky wore Converse and it was the season after Kentucky won a 6th Championship. This was noted by a special patch on the shorts. You can't really tell from these pictures, but the there is a monochrome stripe pattern down the jersey and shorts. 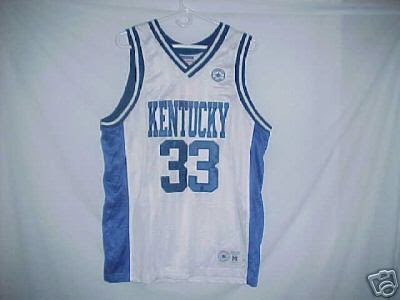 It is similar to the new Nike Kentucky jerseys in which the pattern is the same color as the jersey. It was pretty interesting at the time, hopefully I can find some action shots for you all someday. These Jerseys came out the same year that Converse switched over to using the Chuck Taylor logo on all of their basketball shoes. I had a pair of the shorts, or I should say, that I still have a pair of the shorts. I am just not sure were they are, probably in a box somewhere. That's it for now, thanks for checking out the blog and look for a new poll soon. 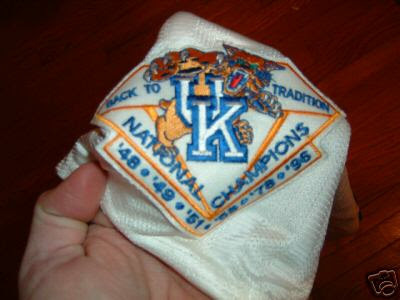 I bought a UK converse warmup today that had the same patch as the jersey. Would this be a team worn one? I am pretty sure that they came on all general release stuff. However, the GR stuff could have had the patch screened on.